Purchase of the Sealed Lords and PR mat stages at the first day of every patch. (Optional) Facebook as main platform of communication, we have a private group and 2 Messenger channels. 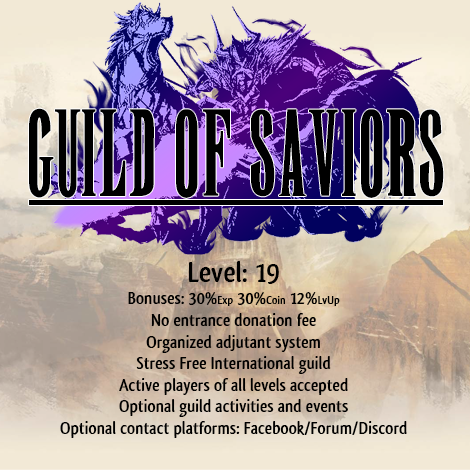 We have 120 member slots. Must keep a communication channel with me either via Discord, Facebook channels, or forum PM. Please contact me here over PM, Discord or Facebook if you are interested. just wanna to ask about i am beginner with level 94 only. but every daily task i will do and guide task all will do, am i qualify in your guide? My name is Bakyo, I used to be a very active player, until I left the game 7 months ago (because of Work/Life). But now I am back XD, I am lvl 422, have all cards (most of them All Max), up to "Imperial Warlords" + TSZ. Just tell me if you have space, because I wanna do the next JO. Yes, we have around 50 free spots!, just keep in mind that we do all of communication on facebook so I would need to add you to 2 group conversations. If you are okey with that contact me over there. bumping, recruit is still open.